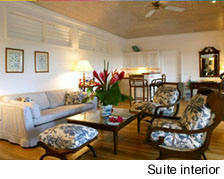 For those of you who do not know Relais & Chateaux Le Toiny. 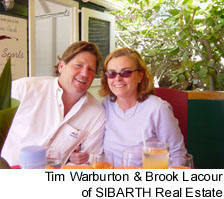 Read on – For those of you who do – just take a quick break and enjoy. 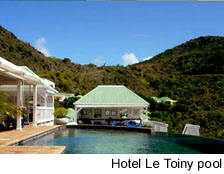 The week before last, my wife told me she had to go to St. Bart's and she had a suite at Le Toiny... Did I want to join her? This was two days before she was leaving and I had not planned on going... But... when she said she was staying at Le Toiny... Well...two things. First, I said no, I couldn't make it. Second, internally I said, 'How am I going to make it?' Calling up trusty Wimco air person Ann Murphy she finds me a bulk air ticket for $512 Wednesday afternoon for travel Thursday. Now we are talking. Clearing my desk was a cinch. My wife had already left for NY earlier, and about 9 pm, I called saying I would be coming along for the ride the next morning. Ok. Definitely spur of the minute. And how great was that? I arrive at Le Toiny, greeted by Manager David Henderson, a Scot who is possibly one of the funniest guys on the planet, and whose humor is exceeded only by the seriousness of attention to detail he gives Le Toiny every day, and it shows. We get ready to pop down to the new Suite 17 – "Oh, sorry, Tim, but I would have given you the larger new 18 – but Julie said she was coming alone...Oh too bad old boy." "Let me know how you like it". Needless to say while this is going on we are sipping champagne as we check in, and within minutes are whisked down to the suite. Mind you - suites are individual villas with pool, living area with an excellent work desk (private fax, web connection etc), bedroom, and a bathroom seriously large enough for the both us, and the largest wide screen TV around. (They could use a few more channels – oh, sorry Dave…) Nevertheless, I did spend a fair amount of time in front of it. I think Kerry was wrapping up the for gone conclusion at the time. Breakfast arrives each morning at the appointed hour (to the nearest minute as far as I could tell) at your table set up by your private pool. A perfect dieter’s breakfast of fresh fruit and pain au chocolat, and any newspaper in the world you want – downloaded within 20 minutes of asking. It comes tabloid size and is an ideal complement to the morning – especially if you want a little more than the Times Fax which does arrive with breakfast unbidden. In our four days we made the restaurant rounds, Maya's, Lafayette Club, Francois Plantation, Filao, Le Toiny, Guanahani, Annie’s La Langouste and, no, I am not going to rate them, But I would recommend Le Toiny’s Sunday lunch buffet, as well as ever the style and pleasure of Lafayette Club. With the soon to be closing Filao, those of you who love eating there need to do so right away. It is a sad loss, and while I am delighted that David Mathews is taking over and rebuilding Filao as part of Eden Rock, I cannot overstate my sadness at losing the garden oasis that is lunch at Filao. Peaceful, quiet., grown-up and good. Having gone to the Sandbar a number of times during the Holidays, we skipped it this time around. But it remains one of my personal pleasure spots. So if you need a quick break, take it from me... this is the spot to get away from it all. 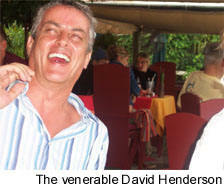 And David says to be sure and remind you that the special package running this summer is a terrific value. 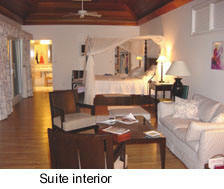 Check it out if relaxing in a Relais & Chateaux is your style of comfort. It is hard to beat.